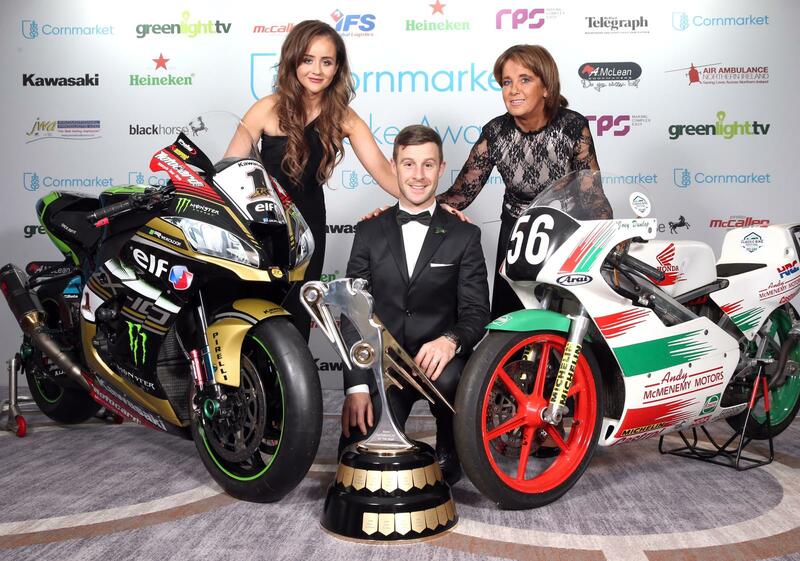 Jonathan Rea made it another four in a row success when he was crowned Cornmarket Irish Motorcyclist of the Year for the fourth consecutive year at the awards ceremony, held in the Crowne Plaza hotel in Belfast last week. This was the sixth time Rea has received the award and it comes hot on the heels of his fourth WorldSBK title. It moved the 31-year-old Templepatrick rider to within two wins of the man who the main award is named after, Joey Dunlop, who won the prize a record eight times. Rea was crowned along with a diverse mix of motorcycle competitors who were honoured for their contribution to the sport in 2018. There was however a sombre moment in the evening when Ballymoney rider William Dunlop, who lost his life in a practice accident during the Skerries Road Races last July, was posthumously inducted into the RPS Group Hall of Fame. "I'm amazed to be mentioned in the same breath as Joey Dunlop, who was my hero in my younger days. To win this award four times running is an honour and I have to thank the many, many people who took the time to vote for me, my family and everybody who has supported me to reach the pinnacle of my sport. I dedicate this success to William Dunlop and all the other riders who paid the ultimate sacrifice in 2018. It has been an honour to stand on the stage tonight with so many talented motorcycle champions from this wee country, we certainly do punch well above our weight."